Keywords are the lifeblood of your Amazon listing. Most Amazon customers find products by doing a search. If your product listing doesn’t contain as many relevant keywords as possible, then customers won’t be able to find your product, and you’ll miss out on sales. In today’s episode I teach you a step-by-step process we use in our own business to generate a master list of keywords for each Amazon listing. What is it used for (or what problem does it solve)? Ask friends, family, employees, co-workers, customers, etc. what things they would search to find your product on Amazon. Add any new ideas they give you to your list. Look up competitors’ listings on Amazon and see what keywords they’re using in their product titles, bullet points, and product descriptions. Add new keywords found to your list. Read reviews and customer questions for your product and competitors’ similar products and see what words customers use to describe the product. Add new keywords to your list. Start typing terms from your master keyword list into Amazon’s search bar and looking at Amazon’s suggested searches…these are actual terms customers are searching. 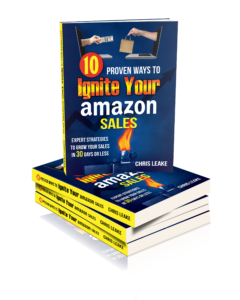 To automate this process, use the free Amazon keyword tool at keywordtool.io/amazon. Add new keywords to your list. Pick out 5-10 of the best search terms on your master list so far and plug them into the Google Keyword Planner. Google will give you a list of search terms related to the ones you entered. Add any new, good terms Google provides to your list. Look up the product detail pages of several of your top competitor’s products on their own websites. Enter the address of each one into the Google Keyword Planner to get a list of search terms related to the product page being examined. Add to your list new keywords these searches reveal. Tier 1: The most important 2-5 keywords/phrases that will go in your product title. Tier 2: The next most important keywords. These will go in your bullet points and product description. Tier 3: These are the remaining keywords. As many as possible should be added to the Search Terms fields in the back end of your product listing. Take your Tier 3 keywords and make a separate list of them, broken down into single words with no duplicates. You can use the free search terms editor from Keyword Inspector to create your list of individual words. Congratulations, you now have your master list of keywords for your product listing! Make sure that all your Tier 1 and Tier 2 keywords get added to your product title, bullets, and description, and make sure that as many Tier 3 keywords as possible get added to your back end Search Terms (50 characters per row, 5 rows, separated by spaces, no duplicates). Once you have all your keywords added to your product listing, it’s important to make sure Amazon is indexing your listing for all of them. To do this, check out How to Make Sure Your Product Appears in Amazon Search Results. This special will only last through the end of 2017 though, so take advantage while you can! To request the Keyword Maximizer special go to our client application (http://ecomleverage.com/client-application), and where it says ‘Anything else we can help with’ put “Keyword Maximizer Holiday Special”.